If you deal with such problems and want practical advice on how to address them, read on. Note: The point of this blog post is to give insight and concrete advice on how to tackle such problems. However, this is not a coding tutorial that takes you line by line through code. I have Jupyter Notebooks (also linked at the end of the post) useful for experimenting with these ideas, but this blog post will explain some of the fundamental ideas and principles. Learning from imbalanced data has been studied actively for about two decades in machine learning. It’s been the subject of many papers, workshops, special sessions, and dissertations (a recent survey has about 220 references). A vast number of techniques have been tried, with varying results and few clear answers. Data scientists facing this problem for the first time often ask What should I do when my data is imbalanced? This has no definite answer for the same reason that the general question Which learning algorithm is best? has no definite answer: it depends on the data. Do nothing. Sometimes you get lucky and nothing needs to be done. You can train on the so-called natural (or stratified) distribution and sometimes it works without need for modification. Throw away minority examples and switch to an anomaly detection framework. Adjust the class weight (misclassification costs). Modify an existing algorithm to be more sensitive to rare classes. Construct an entirely new algorithm to perform well on imbalanced data. First, a quick detour. Before talking about how to train a classifier well with imbalanced data, we have to discuss how to evaluate one properly. This cannot be overemphasized. You can only make progress if you’re measuring the right thing. 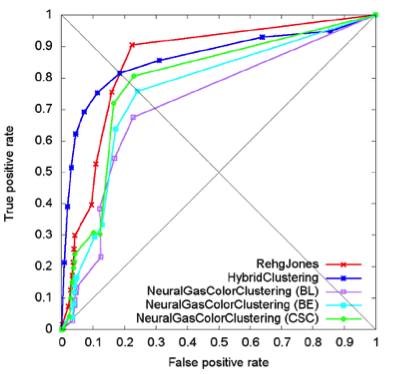 Don’t use accuracy (or error rate) to evaluate your classifier! There are two significant problems with it. Accuracy applies a naive 0.50 threshold to decide between classes, and this is usually wrong when the classes are imbalanced. Second, classification accuracy is based on a simple count of the errors, and you should know more than this. You should know which classes are being confused and where (top end of scores, bottom end, throughout?). 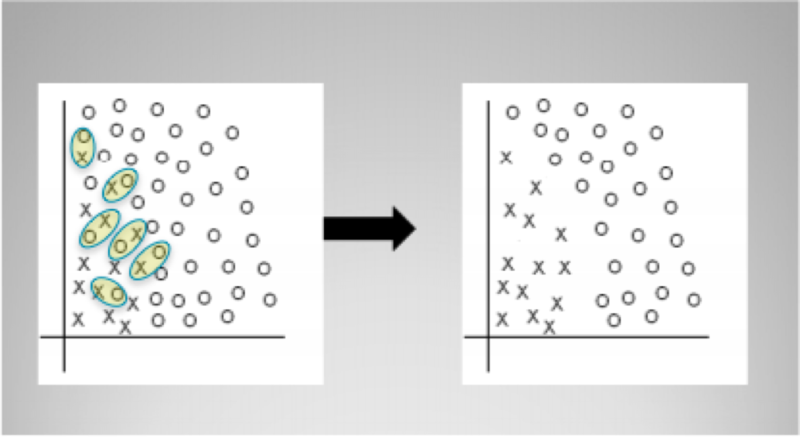 If you don’t understand these points, it might be helpful to read The Basics of Classifier Evaluation, Part 2. 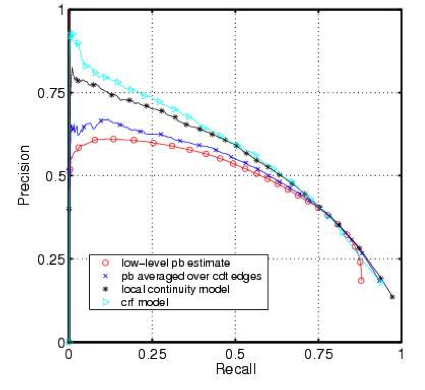 You should be visualizing classifier performance using a ROC curve, a precision-recall curve, a lift curve, or a profit (gain) curve. Don’t get hard classifications (labels) from your classifier (via score3 or predict). Instead, get probability estimates via proba or predict_proba. When you get probability estimates, don’t blindly use a 0.50 decision threshold to separate classes. Look at performance curves and decide for yourself what threshold to use (see next section for more on this). Many errors were made in early papers because researchers naively used 0.5 as a cut-off. No matter what you do for training, always test on the natural (stratified) distribution your classifier is going to operate upon. See sklearn.cross_validation.StratifiedKFold. The Area Under the ROC curve (AUC) is a good general statistic. It is equal to the probability that a random positive example will be ranked above a random negative example. The F1 Score is the harmonic mean of precision and recall. It is commonly used in text processing when an aggregate measure is sought. Cohen’s Kappa is an evaluation statistic that takes into account how much agreement would be expected by chance. The easiest approaches require little change to the processing steps, and simply involve adjusting the example sets until they are balanced. 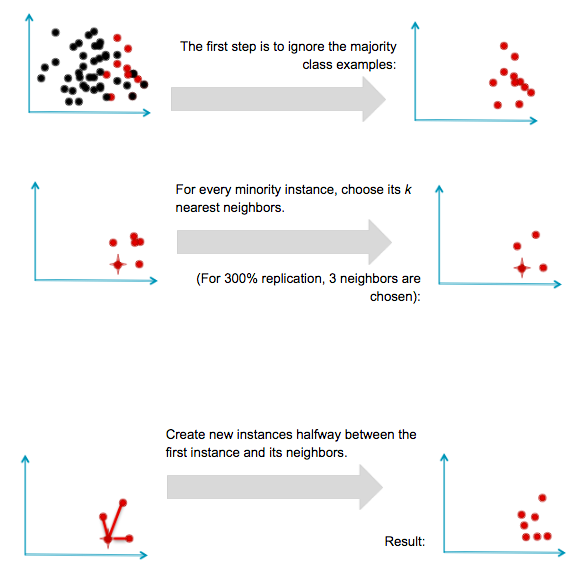 Oversampling randomly replicates minority instances to increase their population. 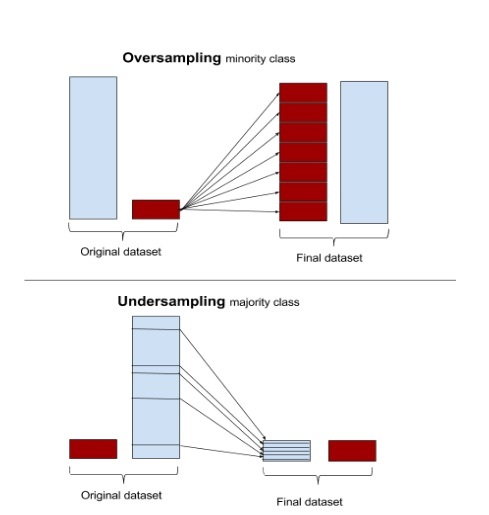 Undersampling randomly downsamples the majority class. Some data scientists (naively) think that oversampling is superior because it results in more data, whereas undersampling throws away data. 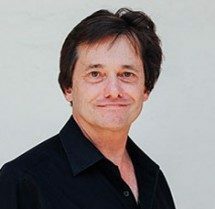 But keep in mind that replicating data is not without consequence—since it results in duplicate data, it makes variables appear to have lower variance than they do. 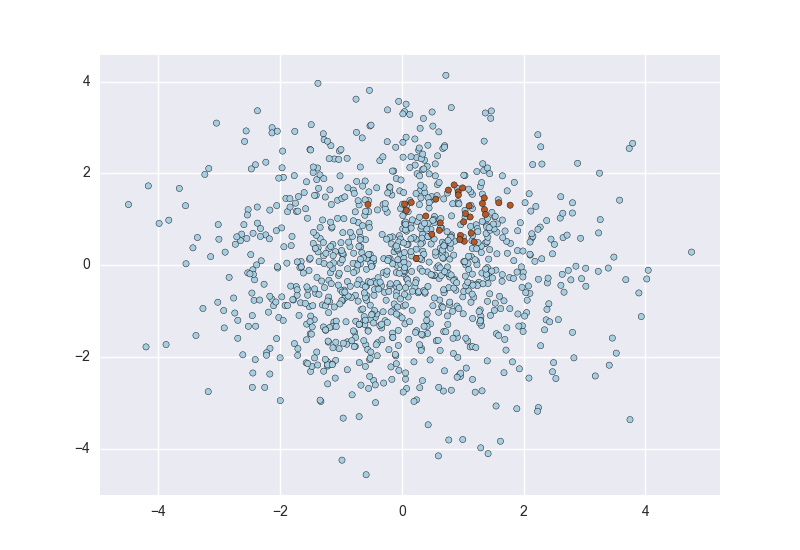 The positive consequence is that it duplicates the number of errors: if a classifier makes a false negative error on the original minority data set, and that data set is replicated five times, the classifier will make six errors on the new set. Conversely, undersampling can make the independent variables look like they have a higher variance than they do. Because of all this, the machine learning literature shows mixed results with oversampling, undersampling, and using the natural distributions. Most machine learning packages can perform simple sampling adjustment. The R package unbalanced implements a number of sampling techniques specific to imbalanced datasets, and scikit-learn.cross_validation has basic sampling algorithms. Bayesian argument of Wallace et al. Possibly the best theoretical argument of—and practical advice for—class imbalance was put forth in the paper Class Imbalance, Redux, by Wallace, Small, Brodley and Trikalinos4. They argue for undersampling the majority class. Their argument is mathematical and thorough, but here I’ll only present an example they use to make their point. Given an x value, what threshold would you use to determine which class it came from? It should be clear that the best separation line between the two is at their midpoint, x=1.5, shown as the vertical line: if a new example x falls under 1.5 it is probably Class 1, else it is Class 2. When learning from examples, we would hope that a discrimination cutoff at 1.5 is what we would get, and if the classes are evenly balanced this is approximately what we should get. The dots on the x axis show the samples generated from each distribution. This technique has not been implemented in Scikit-learn, though a file called blagging.py (balanced bagging) is available that implements a BlaggingClassifier, which balances bootstrapped samples prior to aggregation. Over- and undersampling selects examples randomly to adjust their proportions. Other approaches examine the instance space carefully and decide what to do based on their neighborhoods. For example, Tomek links are pairs of instances of opposite classes who are their own nearest neighbors. In other words, they are pairs of opposing instances that are very close together. Tomek’s algorithm looks for such pairs and removes the majority instance of the pair. The idea is to clarify the border between the minority and majority classes, making the minority region(s) more distinct. 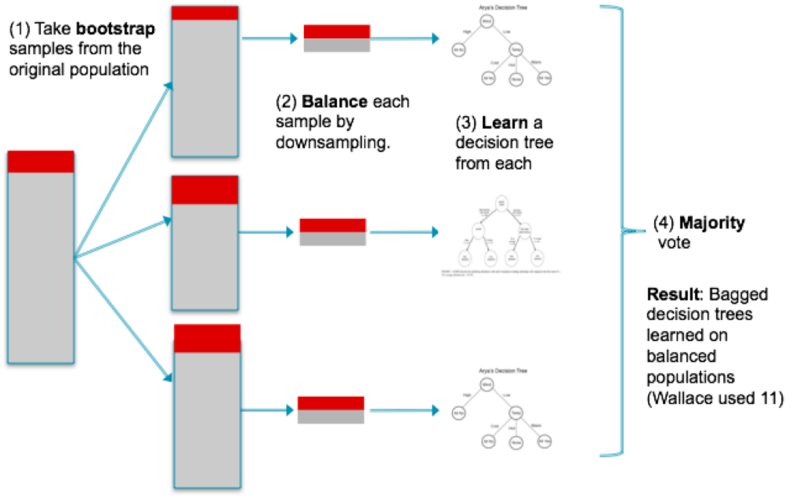 The diagram above shows a simple example of Tomek link removal. The R package unbalanced implements Tomek link removal, as does a number of sampling techniques specific to imbalanced datasets. Scikit-learn has no built-in modules for doing this, though there are some independent packages (e.g., TomekLink). SMOTE was generally successful and led to many variants, extensions, and adaptations to different concept learning algorithms. SMOTE and variants are available in R in the unbalanced package and in Python in the UnbalancedDataset package. It is important to note a substantial limitation of SMOTE. Because it operates by interpolating between rare examples, it can only generate examples within the body of available examples—never outside. Formally, SMOTE can only fill in the convex hull of existing minority examples, but not create new exterior regions of minority examples. Many machine learning toolkits have ways to adjust the “importance” of classes. Scikit-learn, for example, has many classifiers that take an optional class_weight parameter that can be set higher than one. 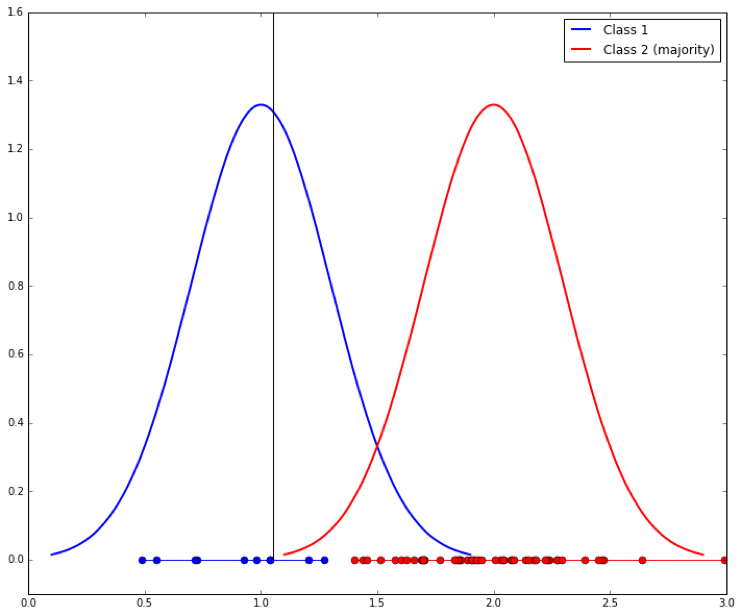 Here is an example, taken straight from the scikit-learn documentation, showing the effect of increasing the minority class’s weight by ten. The solid black line shows the separating border when using the default settings (both classes weighed equally), and the dashed line after the class_weight parameter for the minority (red) classes changed to ten. As you can see, the minority class gains in importance (its errors are considered more costly than those of the other class) and the separating hyperplane is adjusted to reduce the loss. It should be noted that adjusting class importance usually only has an effect on the cost of class errors (False Negatives, if the minority class is positive). It will adjust a separating surface to decrease these accordingly. Of course, if the classifier makes no errors on the training set errors then no adjustment may occur, so altering class weights may have no effect. 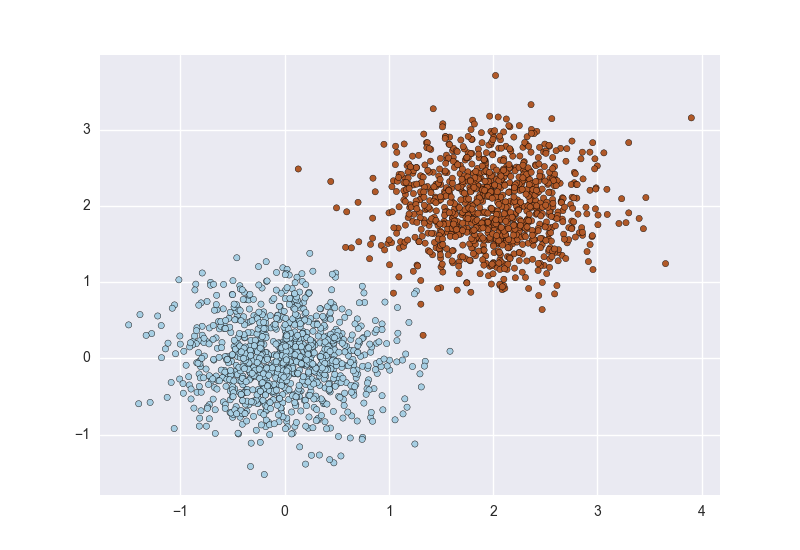 This post has concentrated on relatively simple, accessible ways to learn classifiers from imbalanced data. Most of them involve adjusting data before or after applying standard learning algorithms. It’s worth briefly mentioning some other approaches. Learning from imbalanced classes continues to be an ongoing area of research in machine learning with new algorithms introduced every year. Before concluding I’ll mention a few recent algorithmic advances that are promising. Their goal is to develop a concise, intelligible representation of the minority class. Their equations penalize the number of boxes and the penalties serve as a form of regularization. They introduce two algorithms, one of which (Exact Boxes) uses mixed-integer programming to provide an exact but fairly expensive solution; the other (Fast Boxes) uses a faster clustering method to generate the initial boxes, which are subsequently refined. Experimental results show that both algorithms perform very well among a large set of test datasets. Earlier I mentioned that one approach to solving the imbalance problem is to discard the minority examples and treat it as a single-class (or anomaly detection) problem. One recent anomaly detection technique has worked surprisingly well for just that purpose. 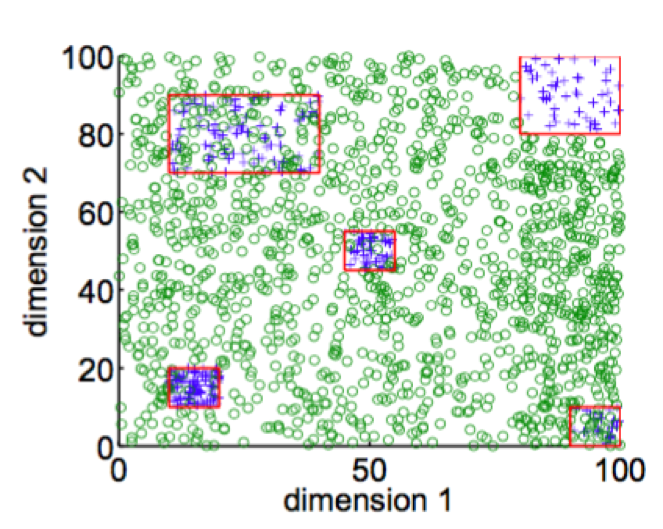 Liu, Ting and Zhou introduced a technique called Isolation Forests6 that attempted to identify anomalies in data by learning random forests and then measuring the average number of decision splits required to isolate each particular data point. The resulting number can be used to calculate each data point’s anomaly score, which can also be interpreted as the likelihood that the example belongs to the minority class. Indeed, the authors tested their system using highly imbalanced data and reported very good results. A follow-up paper by Bandaragoda, Ting, Albrecht, Liu and Wells7 introduced Nearest Neighbor Ensembles as a similar idea that was able to overcome several shortcomings of Isolation Forests. As a final note, this blog post has focused on situations of imbalanced classes under the tacit assumption that you’ve been given imbalanced data and you just have to tackle the imbalance. In some cases, as in a Kaggle competition, you’re given a fixed set of data and you can’t ask for more. But you may face a related, harder problem: you simply don’t have enough examples of the rare class. None of the techniques above are likely to work. What do you do? In some real world domains you may be able to buy or construct examples of the rare class. This is an area of ongoing research in machine learning. If rare data simply needs to be labeled reliably by people, a common approach is to crowdsource it via a service like Mechanical Turk. Reliability of human labels may be an issue, but work has been done in machine learning to combine human labels to optimize reliability. Finally, Claudia Perlich in her Strata talk All The Data and Still Not Enough gives examples of how problems with rare or non-existent data can be finessed by using surrogate variables or problems, essentially using proxies and latent variables to make seemingly impossible problems possible. Related to this is the strategy of using transfer learning to learn one problem and transfer the results to another problem with rare examples, as described here. Here, I have attempted to distill most of my practical knowledge into a single post. I know it was a lot, and I would value your feedback. Did I miss anything important? Any comments or questions on this blog post are welcome. Several Jupyter notebooks are available illustrating aspects of imbalanced learning. A notebook illustrating sampled Gaussians, above, is at Gaussians.ipynb. A simple implementation of Wallace’s method is available at blagging.py. It is a simple fork of the existing bagging implementation of sklearn, specifically ./sklearn/ensemble/bagging.py. A notebook using this method is available at ImbalancedClasses.ipynb. It loads up several domains and compares blagging with other methods under different distributions. Thanks to Chloe Mawer for her Jupyter Notebook design work.